Friedrich Kress von Kressenstein was born in 1870 in Bavaria. As an artillery-officer, formed a part of Liman von Sanders' military mission to Turkey in January 1914, and spent the majority of the war in the service of the Ottoman Empire. With the formal Ottoman alliance with Germany in August 1914, Kressenstein was appointed military adviser to Cemal Pasha, commander of the Fourth Army. It was Kressenstein who advocated and disastrously planned the wholly unsuccessful attack on the Suez Canal in January 1915 which opened hostilities on the Palestine Front, damaging Cemal's reputation rather than his own. Recovering somewhat in stature as a consequence of his successful defence in Sinai at the head of the so-called 'Desert Force', notably at Romani and El Arish in 1916, Kressenstein was subsequently posted to the defence of the garrison at Gaza. In March and April 1917 Kressenstein led the successful defence of Gaza during the Battles of Gaza, although he came close to defeat on the first occasion. However, the British immediately proved a more resourceful and formidable opponent. Having prepared in great secrecy they unleashed the Third Battle of Gaza at the end of October 1917 that secured the British breakthrough in Palestine and led to the fall of Jerusalem in early December. 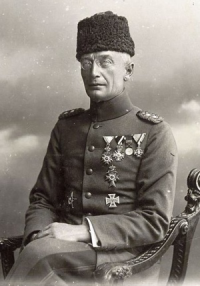 Replaced in command at Gaza on November 5, 1917 by former German Chief of Staff Erich Falkenhayn, Kressenstein was given command of the Turkish Eighth Army in defence of the coastal sector of the front until the summer of 1918, when he was transferred to command a German military mission in the Caucasus. He returned to Germany with the end of the war in 1919, remaining in the army until his retirement as Lieutenant General in 1929. He died in Munich in 1948.